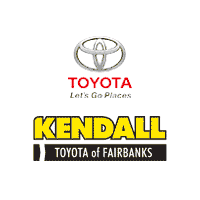 Kendall Toyota of Fairbanks is proud to sell and service Toyota vehicles in the greater Fairbanks area. With models like the new Camry, Prius, and Tacoma, we have something for every taste and budget. Browse our new Toyota inventory to check out the model you’ve been eyeing. If it’s a used car or truck you’re looking for, Kendall Toyota of Fairbanks has a huge selection of Certified Pre-Owned vehicles too. Kendall’s General Manager Jaclyn Browning and the team are committed to complete customer satisfaction and are confident they can help you find exactly what you’re looking for. Even though we offer big city savings and selection, you can always count on us to be your hometown dealer. Kendall Auto Group traces its roots to 1937 when Merrill Kendall became part of the Simmons-Kendall Company, a Ford dealership in Eugene, Oregon. In 1963 Walter DeMartini bought and created Kendall Ford, Inc. The Kendall company has remained a family-owned business since then. At Kendall Auto Alaska, we’re proud of our place among Alaska’s vibrant business community. Kendall has been a part of this great state since 2008 when we join with the Nye Group. We feel fortunate to work and live in this great state and remain committed to our customers, to the communities we serve, and to our employees. Now, with dealerships in Anchorage, Fairbanks, and Wasilla, representing Audi, Ford, Honda, Kia, Lexus, Mazda, Porsche, Scion, Subaru, Toyota, and Volkswagen, we appreciate the opportunity to call Alaska home.